The rapid expansion of GM agriculture in our country, most of which is engineered to be Roundup Ready, has resulted in glyphosate polluting the air we breathe, the water we drink and has been found in the breast milk of 3 out of 10 American mothers (at levels 760 to 1600 times higher than what the European Drinking Water Directive allows for individual pesticides). In farming regions, glyphosate is in the rain that falls and in the urine of the people. 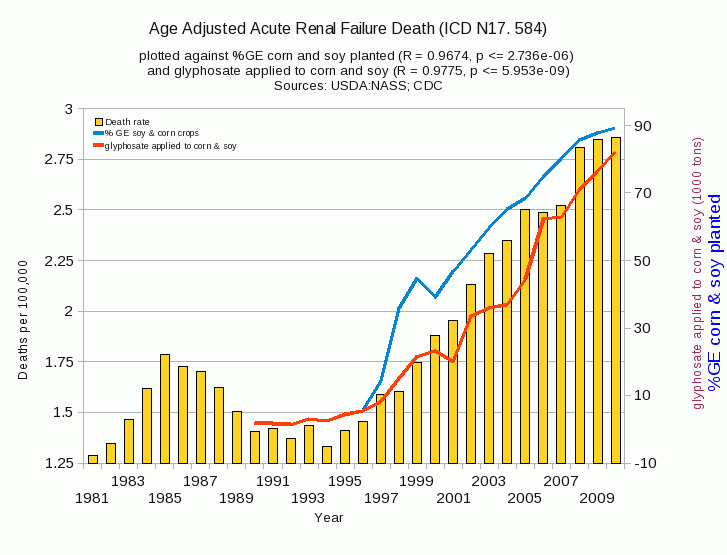 Renal failure death in the US has doubled over the past thirty years. 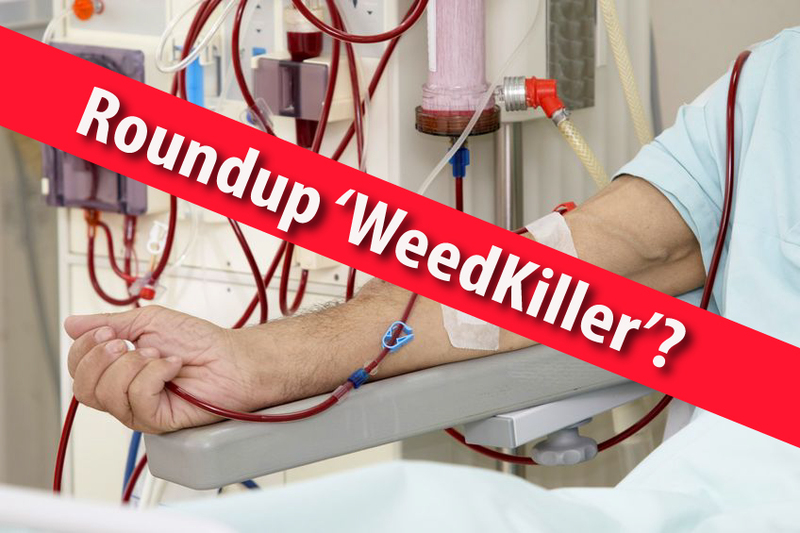 Hospitalization for acute kidney injuries in the US tripled from 1996 (the year Roundup Ready crops were first planted) to 2006 and death rates from Kidney and Renal Pelvis Cancer increased by 50% from 1998 to 2008. When is the last time you heard this discussed in MSM? Please share. This information, while shocking to many who still consider glyphosate herbicide and the GM food produced with it to be relatively non-toxic, is not surprising to those who have been tracking the published research on glyphosate's wide ranging harmful effects, and which now shows a link between glyphosate and several dozen health conditions. You can view the first-hand toxicological citations here: Adverse Health Effects of Glyphosate Formulations. Only days ago, The Center for Public Integrity released a report titled, "Sri Lanka bans Monsanto herbicide citing potential link to deadly kidney disease," citing Sri Lankan President Mahinda Rajapaksa's March 13th decision to impose an outright ban on glyphosate. This decision follows a decision by the legislature in El Salvador last September to approve a ban on glyphosate, but the proposal has not yet been signed into law. The first graph below depicts the 'Age Adjusted Acute Renal Failure Deaths' in the US from 1981 to 2009 plotted against the percentage of GE soy and corn planted, and the tonnage of glyphosate applied to corn and soy, showing death rates more than doubling over the past 30 years. 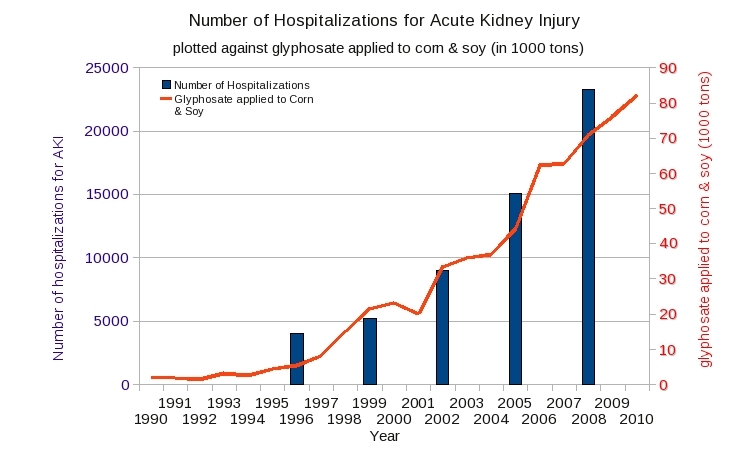 The second graph depicts the 'Number of Hospitalizations for Acute Kidney Injury' in the US plotted against glyphosate applied to corn and soy, between years 1990-2010. Within a single decade (1996-2006), hospitalizations due to acute kidney injury had more than tripled. 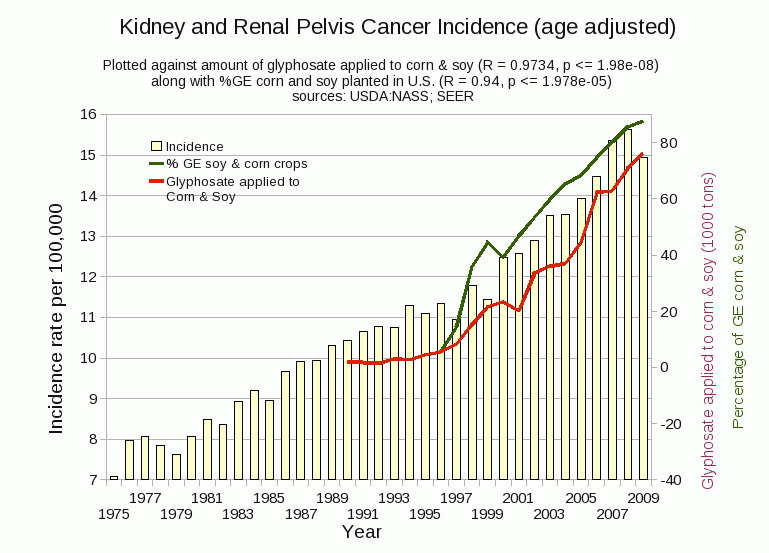 The third graph depicts 'Kidney and Renal Pelvis Cancer Incidence' in the US, plotted against the percentage of GE soy and corn planted, and the tonnage of glyphosate applied to corn and soy, showing death rates increasing by 50% between 1998 and 2008. In previous articles, we have examined the evidence showing that glyphosate is accumulating in our air, rain, groundwater, soil, food, and even persists in the seawater where it may be killing our coral reefs. Far from the 'highly biodegradable,' 'virtually non toxic' chemical it was once marketed to be by its creator Monsanto, it is now known to persist in a way that makes daily exposure inevitable, and which accumulates with time, as its use increases each year.